BTH has an impressive amount of working agreements with Indian universities, especially in the state of Andhra Pradesh, and has had a large amount of Indian students at Masters level studying at BTH in recent years. Besides educational collaboration agreements, BTH is also involved in a number of India related research projects funded by the Swedish research Council, and in a large India Project run over a number of years. Most of these projects refer to the the School of Engineering and also the School of Computing. At the School of Engineering, Jan-Olof Gustavsson and Mikael Åsman (on photo to the right) are the driving forces in internationalisation towards South Asia. 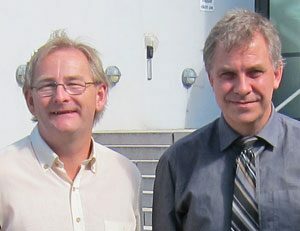 SASNET’s Director Staffan Lindberg and Deputy Director Lars Eklund visited BTH:s then campus Ronneby in March 2007. They visited the campus for a discussion of its activities related to South Asia and a discussion of what SASNET can do for the promotion of its South Asia activities. They were then hosted by Jan-Olof Gustavsson and and Mikael Åsman from the School of Engineering, but also by Maria Engelmark, Head of International Office; and Lars Lundberg, Professor of Computer Systems Engineering. Read a report from the 2007 SASNET visit to Ronneby. In September 2011, Lars Eklund again visited BTH, this time along with his colleague Julia Velkova. Read their report on BTH India 2011 activities. For many years, BTH has also had an amazing proportion of foreign students. In 2006 there were about 1 200 foreign students studying at the various Masters programmes in Technology, coming from 43 different countries, most of them from South Asia (Pakistan, Bangladesh and India), China and Nigeria. BTH had also developed cooperation with universities in both Pakistan and India, including a joint Double Diploma programme in the fields of Signal Processing, Software Engineering and Telecommunication Systems with Jawaharlal Nehru Technological University (JNTU) in Hyderabad (later also in Kakinada) and Andhra University in Visakhapatnam. More information about BTH’s educational collaboration with Indian universities. Since 2007 a lot of things have happened. The number of freemoving non-European students has dramatically fallen with the introduction of tuition fees at Swedish universities, including BTH. On the other hand, formal educational collaboration programmes with universities in south India have been further developed, not the least because of work done by Mr. Gurudutt Velpula, an ex-student at BTH hailing from Hyderabad, since 2006 working as Project Coordinator for projects between India and BTH. Whereas the joint Double Diploma programme is now being phased out, BTH instead has introduced a new unique 5 year Integrated BSc + Masters programme in Signal Processing, Software Engineering and a few other specialisations with their current partner universities in Andhra Pradesh. The concept is that students study for the first 3,5 years at their home universities and spend only the remaining 1,5 years at BTH. Still they feel from the start that they are part of a programme leading up to a BTH degree. Already 60-70 Indian students have joined the programmes and when it is fully functional, it will consist of around 200 individuals. The first degree holders are expected to complete in early 2014. BTH also puts strong focus on collaboration with business as being part of its Triple Helix strategy, both at home in Blekinge and in India, and especially with Ericsson represented in Karlskrona as well as Chennai. In the autumn of 2010 BTH signed an agreement with Ericsson India in Chennai which gives BTH students the opportunity to do their project work at the Ericsson office in Chennai. Senior researchers at IIT-M will share in supervising these student projects, in collaboration with supervisors at BTH. Accommodation will be offered for the Swedish students at the IIT-M Research Park, at the edge of the IIT-M campus in Chennai. Finally, BTH has been much involved in The India project in Blekinge, as it was called, run by the regional administration in the South-East Swedish region of Blekinge. Its aim was to develop links not only regarding education and research but also in business between Blekinge and the South-East region of India, an area of India where the on-going industrial and economic expansion is extremely high, especially concerning the IT- and telecommunication industry. It was launched in 2008 after receiving a SEK 1.3 m grant from the Council of Region Blekinge. In February 2009 a large delegation from Blekinge, led by the BTH Vice Chancellor Ursula Hass, the Governor (landshövding) of Blekinge, Ms. Gunvor Engström.The project leader for the India Project, now completed, was Eva-Lisa Ahnström. Full information about the India Project. In South Asia, BTH previously also developed cooperation with three universities in Pakistan (Fatima Jinnah Women’s University in Rawalpindi, the Air University in Islamabad, and Ghulam Ishaq Khan Institute of Engineering Sciences and Technology, GIKI, in Topi, NWFP). The contacts with Fatima Jinnah Women’s University in Pakistan resulted in the launch of a teachers and studenst exchange programme, funded by the Swedish International Programme Office for Education and Training (Internationella programkontoret). In March 2007, the Dept. of Systems and Software Engineering received a first Linnaeus-Palme International Exchange Programme grant for the period 2007-08. More information about the Linnaeus Palme grants 2007.